Flowing for more than 15 miles from Walloon Lake to Little Traverse Bay and splitting Petoskey in half is Bear River, boosting some of the finest whitewater in the Lower Peninsula. Within its final mile, just blocks from the city’s famed Gaslight Shopping District, the Bear River drops 75 feet in a series of rapids, swirls and even a small waterfall. 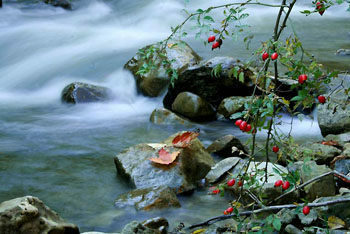 This is whitewater that attracts the interest of thrill-seeking kayakers. With some sections rated Class III in difficulty. But the river and rugged gorge it created at the end is also the focal point of the trail system of the Bear River Valley Recreation Area, Petoskey’s newest park. Dedicated in 2011, the 36-acre recreation area stretches along both sides of the river from the Lake Street Bridge to the Standish Ave Bridge. In between, in the middle of this city, is a narrow valley in a natural setting characterized by steep, wooded bluffs, open meadows and a river churning in whitewater. The park is best known for it’s kayaking but also provides opportunities for hiking, cycling, inline skating and Nordic skiing in the winter. The trail system is a mix of paved trails and natural paths that is utilized by the North Country Trail as part of its North Dakota-to-New York system. The paved trail begins at Sheridan Street trailhead and extends a mile along the east bank of the river to Mineral Well Park at Lake Street. Unpaved paths run from Riverbend Park off Standish Avenue to Sheridan Street, along the parts of the west bank and as short spurs that descend down to the river. The North Country Trail, marked in blue blazes, winds along both banks, crossing the river on a foot bridge. 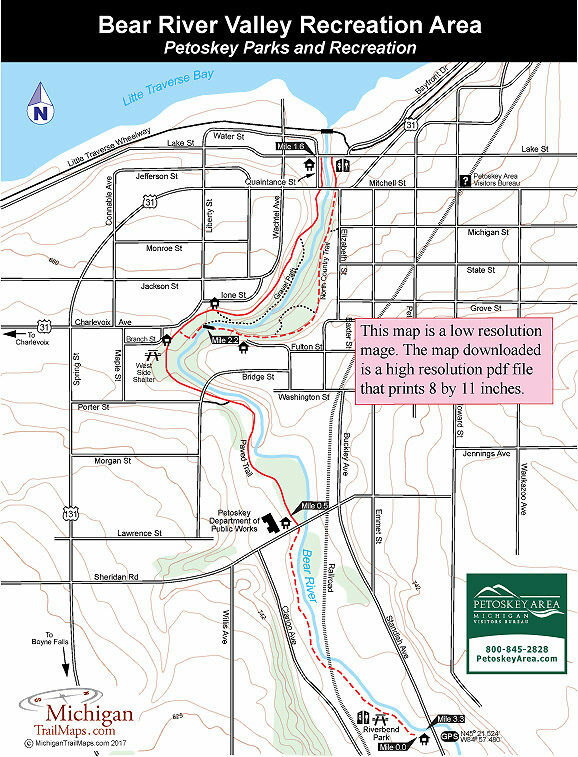 The trail described below is a round-trip from Riverbend Park that includes backtracking almost a mile for a 3.3-mile outing. Beginning at the Sheridan Street trailhead would reduce mileage to 2.2 miles and starting at Lake Street and walking both sides of the river to the pedestrian bridge would be a 1.2-mile loop. The best time to be on the trail to watch kayakers play in the whitewater is in the May and early June when the river is at its highest. Check the calendar on the Northern Michigan Paddling Club’s website (www.northernmichiganpaddlingclub.com) for paddling events that are held on the Bear River. 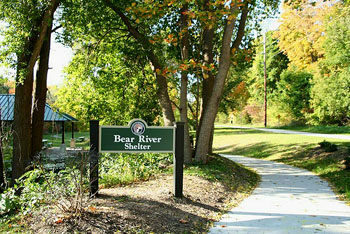 Located next to the Petoskey High School football field, Riverbend Park serves as the south end of the Bear River Valley Recreation Area and includes a picnic area, shelter, restrooms, drinking water, even a skateboard park. The trail is well posted near the entrance where it heads north and immediately begins following the river. This a scenic stretch where you are constantly able to stop and take in the river. Within a quarter mile the trail crosses a set of railroad tracks in a spot that is well posted and features boardwalks and observation decks. You remain close to the Bear River and at Mile 0.5 pop out at Sheridan Road where across the street is the Petoskey Department of Public Works building. Off its parking lot to the west is the trailhead for the trail that is now a paved path as well as a launch site for kayakers and canoers. The trail swings away from the river, passes underneath Bridge Street and then reaches the West side Shelter and an access from Branch Street. At Mile 1.1 you arrive at a junction where the NCT departs the paved path and descends to the river via a gravel travel and a foot bridge across the river. The Bear River and its best stretch of whitewater is visible from either trail but the gravel path puts you closer to the rapids and from the middle of the bridge you get a good view of a small waterfall. The paved trail continues to skirt the river bluff, passing two more junctions to the gravel path below and the Ione Street Access before reaching Mitchell Street. On the other side the trail enters Mineral Well Park with its 1917 pavilion, World War I monument and raised formal garden. The trail reaches the Lake Street bridge at Mile 1.6, crosses it and is posted on the west side where it soon becomes a unpaved path. South of Mitchell Street you pass the huge raised overlook deck at the Michigan Street access and at Mile 1.9 arrive at a short spur that descends to the river. 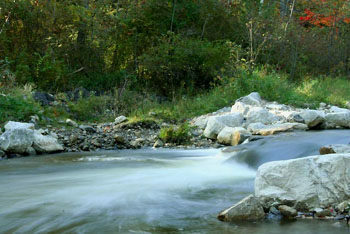 The main trail remains on top of the river bluff and is stretch is one of most scenic of the entire system. You are well hidden from the urban scene that surrounds you in a natural setting that allows you stare into the gorge that Bear River has cut. At Mile 2.2 the main trail descends to the river and uses a foot bridge to cross the river. On the other side a huge stone stairway leads up to the paved path where you head south to backtrack the first mile. At Riverbend Park there are parking areas and restrooms and in Mineral Well Park off Lake Street are restrooms, pavilion and parking. The West Side Shelter is also located at the Branch Street trailhead and scattered along the river are launch/take out landings for kayaks and canoes. There are no entry or vehicles fees for Bear River Valley Recreation Area. The main trailheads are located at West Lake Street, Sheridan Street adjacent to the Petoskey Department of Public Works and Riverbend Park off Standish Avenue. Other access points include and off of Branch Street, Fulton Street, the east end of Michigan Street and Ione Street. 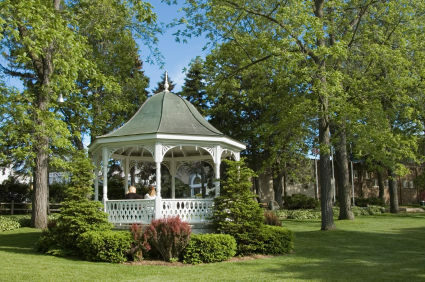 Contact the City of Petoskey Department of Parks & Recreation (231-347-2500; www.petoskey.us/departments/parks-a-recreation) or the Petoskey Area Visitors Bureau (231-348-2755, 800-845-2828; www.petoskeyarea.com).